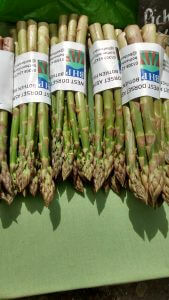 Bothen Hill asparagus is available every Saturday at Bridport street market, opposite the town hall, and Bridport farmer’s market on the second Saturday of each month. We also supply a small hand full of farm shops – Modbury farm shop, Millers farm Shop, Washingpool farm Shop and The Out of Town Farm shop. Our favourite way to cook asparagus is on a griddle with some butter and almonds – quick and easy. You can find the recipe here.